It is also possible to let the telescope track the star and read out line after line using WinScan or SCAN( you will also get trails). Then you can adapt the readout speed to the brightness of the star. You can read out very long trails, so you do not need to know the exact time of the occultation. 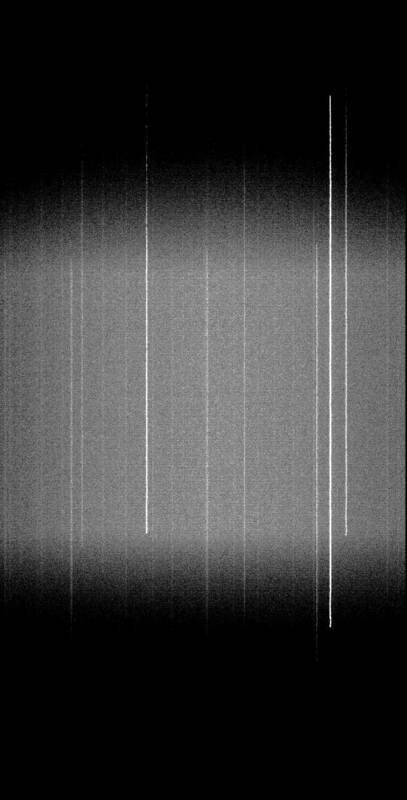 The rest of the lines of the CCD are read in, with closed shutter. (ramping at the begin and the end of the image) Because of the ramping background and range have to be adapted to find the begin and the end of the trails. The readout speed was 0.050000 seconds per line. The bright trail in the left of the image is caused by GSC 129 309 mag 8.87 . 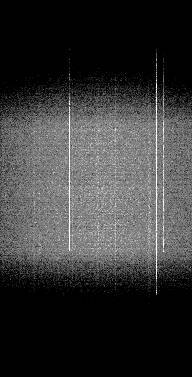 Form the readout speed and the time of the begin of the image and the distance from the begin of the trail to the begin of a occultation the time of the begin of the occultation and the duration of the occultation can be calculated. The time of the begin of the image is stored in the file header. If a fast readout speed is needed, it can be used the planetary mode or the tracking CCD. See: Details readout speed. You may check for the highest possible readout speed before. (You may check the time stamp file) I found possible readout speeds with the ST-7 from 0.027 sec for 765 columns, for planetary mode with 100 columns 0.0095 sec, and with the tracking CCD at planetary mode 25 columns 0.002 sec. It can be also used binning. Maybe there have to be made some more tests, before using this technique to observe occultation's. This technique may be also used for observing variable stars with a short time resolution. It can be also elevated the size and frequency of the seeing.